Vincent van Gogh’s still lifes Irises and Roses were investigated to shed light onto the degree to which the paintings had changed, both individually and in relation to each other since they were painted, particularly in regard to the fading of the red lakes. Non-invasive techniques, including macroscopic X-ray fluorescence mapping, reflectance imaging spectroscopy, and X-radiography, were combined with microanalytical techniques in a select number of samples. The in-depth microchemical analysis was necessary to overcome the complications that arise when evaluating by non-invasive methods alone the compositions of passages with complex layering and mixing of paints. The results obtained by these two approaches were complemented by color measurements performed on paint cross-sections and on protected edges, and with historical information provided by the artist’s own descriptions, early reviews and reproductions, and the data was used to carry out digital color simulations that provided, to a certain extent, a visualization of how the paintings may have originally appeared. Irises, 1890, Vincent van Gogh. The Metropolitan Museum of Art #58.187. Zn (upper right), Pb (bottom left), and Br (bottom right) distribution maps acquired by XRF imaging. Irises and Roses in the collection of The Metropolitan Museum of Art (The Met), Roses in the collection of the National Gallery of Art, Washington, and Irises at the Van Gogh Museum in Amsterdam were examined in preparation for the exhibition Van Gogh: Irises and Roses, that took place at The Met in 2015, curated by Susan Alyson Stein with a technical examination directed by Charlotte Hale . The exhibition reunited the four still lifes, painted as a series in May 1890, shortly before the artist’s departure from the asylum of Saint Paul de Mausole in Saint-Rémy, Provence. One of the central aspects considered in the exhibition was the degree to which the paintings had changed, both individually and in relation to each other, since Van Gogh painted them, particularly in regard to the fading of the red lakes. Digital color simulations of the four paintings were included in a video presentation on the series, shown in the exhibition and on The Met’s website. The colorants present in lake pigments have relatively high tinting powers and, therefore, are used generally in small amounts in objects of cultural significance, which makes them difficult to detect, especially when sampling is limited. UV–vis fluorescence and visible absorption spectrometry have been applied to identify organic colorants in works of art [2, 3], however these techniques give spectra with broad features that are not always useful . In the FTIR analysis of lakes, the presence of bands due to the binding media frequently interferes with the identification of the colorants, and the Raman spectroscopic analysis is often limited by the high fluorescence of most organic colorants. Surface enhanced Raman spectroscopy (SERS) gives good results in the analysis of red lake pigments and dyes, both in term of specificity and detection limit [4, 5], nevertheless the technique has limitations for resolving mixtures of two or more colorants. High performance liquid chromatography (HPLC) is well established for identifying organic colorants in artworks because it permits not only a qualitative identification of the dyes, but also a quantitative estimation and, therefore, it is highly specific. Major limitations of HPLC are the relatively large sample sizes and the complex sample preparation required [4, 6]. Laser desorption ionization mass spectrometry (LDI-MS) has been applied to detect dyestuffs in works of art , and has given good results in samples from archeological objects but not in paint cross-sections due to the interference from the binding media. The major benefits of LDS-MS are the high resolution and the possibility to detect the dye-mordant complexes as a whole . Pyrolysis–gas chromatography/mass spectrometry (Py–GC/MS) has also been used to identify synthetic organic pigments in paintings. In some cases, this technique produces the same fragments for more than one pigment, but the overall pyrolysis profile generally allows the identification of the individual pigment; however only the most abundant products are typically detected . 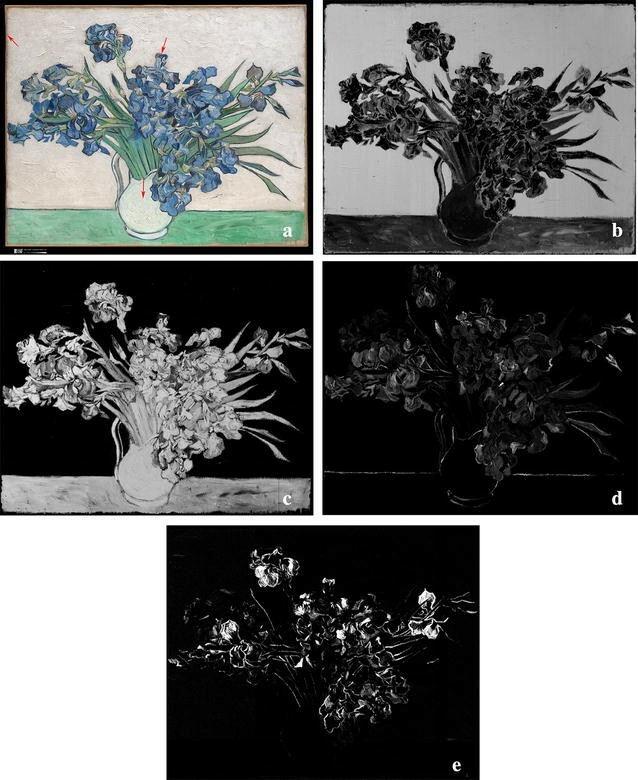 The approach to the re-colorization of Irises and Roses was based on information gathered using a broad range of analytical techniques, applied in a non-invasive manner and in a few selected microsamples, that included macroscopic X-ray fluorescence (MA-XRF) mapping, reflectance imaging spectroscopy (RIS), fluorescence imaging, X-radiography, Raman spectroscopy, high performance liquid chromatography (HPLC), surface enhanced Raman spectroscopy (SERS), and scanning electron microscopy-energy dispersive X-ray spectrometry (SEM–EDS). The results were complemented by color measurements performed on paint cross-sections and on protected edges, with historical information provided by the artist’s own descriptions, early reviews and reproductions, and with what had been previously published on Van Gogh’s materials and techniques [10–13]. The use of red organic lake pigments by Vincent van Gogh during different periods of his life and the impact of their permanence on a large number of his paintings has been widely reviewed and discussed by numerous authors (see, for example [11–16]). The present article will focus on the contribution of chemical analyses and imaging to the assessment of color changes due to fading in the paint passages containing organic red pigments and to the virtual color simulations of Irises and Roses in The Met’s collection. For more information on other aspects of the technical examination, please see . The MA-XRF instrument used consists of a measuring head that is moved across the painting surface by means of a motorized X–Y stage with a maximum travel range of 80 × 60 cm. The measuring head includes a 30 W Rh-target micro-focus X-ray tube and a Silicon Drift Detector (SDD) to collect the fluorescence signal. The X-ray source was operated at 50 kV and 0.5 mA, and the resulting beam was focused by means of a polycapillary optic. A Z motor allowed optimising the spot size to the step size by varying the distance between the painting and the measuring head. The overall paintings were scanned at 250 ms/pixel with a 1 mm step size. The spectra were processed by employing a combination of PyMca and Datamuncher software as described in  and by using the Bruker M6 Jetstream software. 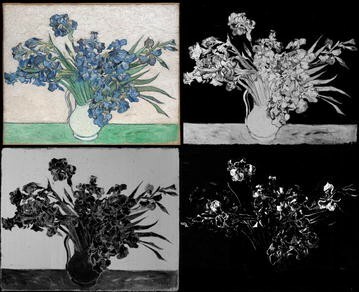 Irises and Roses were examined using hyperspectral reflectance imaging spectroscopy by acquiring reflectance spectra from 400 to 1680 nm across the surface of each work. The primary interest was to get accurate reflectance spectra of the red paints and their spatial distributions. These spectra and maps were used to identify the pigments present. Hyperspectral image cubes were collected with optimized whiskbroom line-scanning imaging spectrometers (Surface Optics Corporation). Details of the setup have been described previously . The first spectrometer utilized an EMCCD detector (ProEM1024, Princeton Instruments) operating from 380 to 1000 nm with 2.5 nm sampling, at a light level of 1500 lux for ~5 min per cube. The image cubes are 1024 by 1024 spatial and 280 spectral. The second spectrometer utilized is an InGaAs array (SUI 640SDV, Sensors Unlimited) operating from 967 to 1680 nm with 3.4 nm sampling, ~1000 lux, and an integration time of 30 ms per line. The image cubes have 640 by 640 pixels in the spatial dimensions and 256 along the spectral axis. The image cubes were dark-corrected, flat-fielded, and calibrated to apparent reflectance using diffuse reflectance standards (Labsphere Inc.). The calibrated image cubes were spatially registered using a point-based algorithm . Spectral analysis of the image cubes was done using convex geometry methods  and mapping methods employing Match Tuned Filters . Only the findings for The Met’s Roses are discussed in this article. Color coordinates (L*a*b* values) useful for the color simulations were obtained using a fiber optic reflectance spectroradiometer model FS3 (ASD Inc., Boulder Co.). Selected samples were removed using a scalpel under high magnification. Some of these samples were analyzed as scrapings and some were mounted as cross-sections in Technovit® resin and polished using Micromesh® cloth followed by ion milling with a Hitachi IM4000 ion milling system. After ion milling, cross-sections were carbon coated prior to SEM–EDS analysis. Analyses were performed with a FE-SEM Zeiss Σigma HD, equipped with an Oxford Instrument X-MaxN 80 SDD detector. Backscattered electron (BSE) images, energy-dispersive spectrometry (EDS) analysis, and X-ray mapping were carried out with an accelerating voltage of 20 kV in high vacuum. Raman spectroscopy measurements were done on sample scrapings and on the cross-sections using a Renishaw System 1000 coupled to a Leica DM LM microscope. All the spectra were acquired using a 785 nm laser excitation focused on the samples using a 50× objective lens, with integration times between 10 and 120 s. A 1200 lines/mm grating and a thermoelectrically cooled CCD detector were used. Powers at the sample were set between 0.5 and 5 mW using neutral density filters. For the SERS measurements on the sample removed from the background area in Irises, a silver colloid synthesized by microwave-assisted glucose reduction of silver sulphate in the presence of sodium citrate was used as a substrate . A 0.8 μL drop of a 1% HNO3 solution was placed on the sample in order to induce the extraction of the dye and then 2 μL of the silver colloid were added on top of the drop. The aggregation of the nanoparticles is induced by the presence of HNO3, which also acts as a pretreatment agent particularly suitable for xanthene lakes . In the case of the samples removed from the tabletop and one of the stems in Roses, it was necessary to carry out a pre-treatment by placing them on a polyethylene sample holder in a micro-chamber filled with HF vapors for 5 min. This step is often fundamental to hydrolyze natural dyes-based lakes and make the free dyes available for adsorption on the nanoparticles, as previously demonstrated . Once the sample holder was removed from the chamber, 2 μL of silver colloid were placed directly on the sample followed by 0.5 μL of a 0.5 M KNO3 solution to induce the aggregation. All the SERS spectra were obtained using a Bruker Senterra Raman spectrometer equipped with a charge-coupled device (CCD) detector and a 1800 rulings/mm holographic grating providing a resolution of 3–5 cm−1. The 488 nm radiation emitted by a Spectra Physics Cyan solid state laser was employed as the excitation source, with a power at the sample of about 0.7 mW. The spectra were acquired with two integrations of 15 s each, focusing just below the top surface of the dye-colloid drop with an Olympus 20× LMPlanFL long working distance microscope objective. Methanol and acetonitrile (HPLC grade), hydrofluoric acid (HF), formic acid (88%), oxalic acid, and pyridine (analytical grade) were purchased from Fisher Scientific (Pittsburgh, PA), and the eosin Y disodium salt was purchased from Sigma-Aldrich (St. Louis, MO). Deionized water (18 MΩ/cm) was produced by a system equipped with mixed bed ion exchange tanks and one micron filters (Evoqua water technologies, NJ), and was subsequently filtered with a 0.45 µm Durapore® membrane filter (Fisher Scientific, Pittsburg, PA). The reference woolen yarn dyed with brazilwood (Caesalpinia echinata Lam.) used in this study was made by conservators in the Textile Conservation Department, The Metropolitan Museum of Art, NY. The samples (approximately 0.5 mm × 0.5 mm) removed from the paintings were ultrasonicated with 20 µL of a mixture of acetonitrile and methanol (1:1 v/v) for 30 min, and left overnight at RT. 20 µL of 4 M aqueous HF were added to the vial, vortexed left at RT for several hours  and occasionally ultrasonicated. The HF solution was then evaporated under a nitrogen stream. 40 µL of methanol were added to the vial and they were then evaporated under a nitrogen stream. This step was repeated three more times in order to remove HF residues. The extract was dissolved in 7 µL of methanol and then 7 µL of 0.88% aqueous formic acid (v/v) were added, subsequently centrifuged at 3500g for 10 min and the supernatant was injected to the HPLC system. The analytical system used consisted of a 1525 μ binary HPLC pump, 2996 PDA detector, 1500 series column heater, in-line degasser and a Rheodyne 7725i manual injector with 20 μL loop (Waters Corporation, Milford MA). A Rheodyne column switching valve (Waters Corporation, Milford MA) was connected between the guard column and the analytical column for the purpose to remove remaining the HF residue in the sample. An Xterra RP18 (3.5 μm, 2.1 mm I.D. × 150.0 mm) reverse-phase analytical column was used with a guard column (Xterra RP18 3.5 μm, 2.0 mm I.D. × 10.0 mm) (Waters Corporation, Milford MA), and a flow rate of 0.2 mL/min (0.3 mL/min while washing the HF residue to the waste). The column pre-filter (Upchurch ultra-low Volume pre-column filter with 0.5 µm stainless steel frit, Sigma-Aldrich, St. Louis MO) was attached in front of the guard column. Column temperature was 40 °C. The operation and data processing software used was Empower Pro (2002). The mobile phase was eluted in a gradient mode of 0.88% formic acid in de-ionized water (v/v) (A) and methanol (B). In the beginning, 100% (A) was eluted for 10 min to the waste from the rear of the guard column. The flow started at 0.2 mL/min, increased to 0.3 mL/min for 2–9 min, and returned to 0.2 mL/min at 10 min. Then the mobile phase was switched to elute to the analytical column from the guard column using a switching valve. The gradient system after the switching was as follows: 100% (A) to 90% (A) in 8 min in a linear slope, to 60% (A) in 7 min in a linear slope, to 5% (A) in 20 min in a linear slope, to 90% (A) in 1 min in a linear slope and held at 90% (A) for 24 min, and then the flow was switched to the waste, brought to 100% (A) in 1 min and held at 100% (A) for 5 min. Over a ground preparation composed principally of lead white, Van Gogh built up the flowers with cobalt blue, zinc white, and eosin red-containing paints, and with Prussian blue and eosin red in the outlines, as reflected in the Pb, Co, Zn, and Br distribution maps presented in Fig. 1b–e, and in the Fe distribution map shown in the Additional file 1: Figure S1. The identification of these pigments was corroborated by Raman spectroscopy and SEM–EDS analysis on paint cross-sections, some of which are shown below, and on sample scrapings. Guided by the XRF distribution maps, a limited number of samples for analysis by Raman spectroscopy, SEM–EDS, SERS, and/or HPLC were removed from this painting. The locations of the samples relevant to this article are indicated in Fig. 1a. Examination of the paint cross-section removed from a flower revealed that the blue and red lake-containing paints were applied wet on wet (Fig. 2a, b). Normal Raman spectra acquired in the red lake pigment layers in this cross-section present bands at ca. 642, 712, 1174, 1280, 1345, 1501 and 1620 cm−1, that are consistent with the presence of an eosin lake , and a strong feature at 978 cm−1 due to PbSO4 . In Fig. 3a, the spectrum recorded in the red paint layers in this sample (spectrum 1) is compared to a spectrum acquired in an eosin red lake reference sample, with barite as a substrate, from a 1900 catalogue of early synthetic dyes  (spectrum 2). SEM–EDS analysis in the red layers in this sample confirmed the presence of lead sulfate and showed Br due to eosin red. In the red layer at the bottom of the stratigraphy of the cross-section, Ca and Ba, most likely originating in calcite and barium white, were detected by SEM–EDS. An SEM image of this sample is presented in Fig. 2c. Geldof et al. in their study on the use of eosin red lakes in 34 paintings by Van Gogh reported that in all cases in which the inorganic substrate of the lake had been analyzed, Al has been identified . In two of these paintings, Garden with Butterflies and Portrait of Dr. Gachet, both dating to 1890, these authors identified Pb and S most likely in the form of PbSO4 in the eosin lake-containing paint. They proposed that the compound is formed as a product of the reaction of the dye and aluminum sulfate in the presence of lead acetate, which accords with a 19th century recipe for making the lake, but that it is also possible that PbSO4 was added as an extender. In this sample, SEM–EDS analysis confirmed the presence of Co and showed that Zn is also present in the blue paint. When the cross-section is examined under UV illumination, relatively large pigment particles that fluoresce bright yellow are visible in the blue paint layers (Fig. 2b); in normal illumination they appear an indistinct brownish color. SEM–EDS analysis of these particles showed that they are mainly organic, and that they contain mainly Zn and Br, in addition to C (the corresponding spectrum is shown in the Additional file 1: Figure S2. Since all the sample cross-sections were ion-milled, smearing from other paint layers is ruled out as the source of these elements. The normal Raman spectrum acquired in the particles that fluoresce yellow suggests the presence of a lake pigment (Fig. 3a, spectrum 3), but this lake could not be firmly identified. The presence of Br in our sample indicates that the lake might be a compound related to eosin red. Eosin equivalents, with similar absorption spectra but different retention times from eosin and probably formed during the production of the dye, and eosin related components with different absorption spectra than eosin that are either degradation or side products, have been reported in paintings by Van Gogh based on HPLC analyses . According to F.H. Jennison’s 1900 catalogue on the manufacture of lake pigments, ZnSO4·7H2O was used to precipitate eosin lake pigments, ‘but not often’ ; however, no S was identified in our sample by SEM–EDS. Other possible sources of Zn are ZnO, which has also been reported as a substrate in lakes , and zinc chloride, that was used as a condensing agent in the manufacture of fluorescein, a starting material for the synthesis of eosin . To our knowledge, Zn has not been previously identified in substrates of eosin lakes used by Van Gogh, as mentioned above, but, in some cases, this may be explained by the fact that Van Gogh frequently used eosin lake pigments in mixtures with zinc white , and that ion milling of sample cross-sections is necessary to rule out its interference. To identify the lake pigment, or mixture, in this sample with more certainty, a larger sample would need to be removed for HPLC analysis. If in fact the yellow fluorescent particles contain a red lake, the paint used in the cross-section shown in Fig. 2a, would have been purple. In the background of the painting, some faint pink strokes are visible with the naked eye, but no clear indication of the presence of Br was obtained by XRF mapping (Fig. 1e). Raman spectroscopy and SEM–EDS analyses of a cross-section removed from the left edge of the painting (Fig. 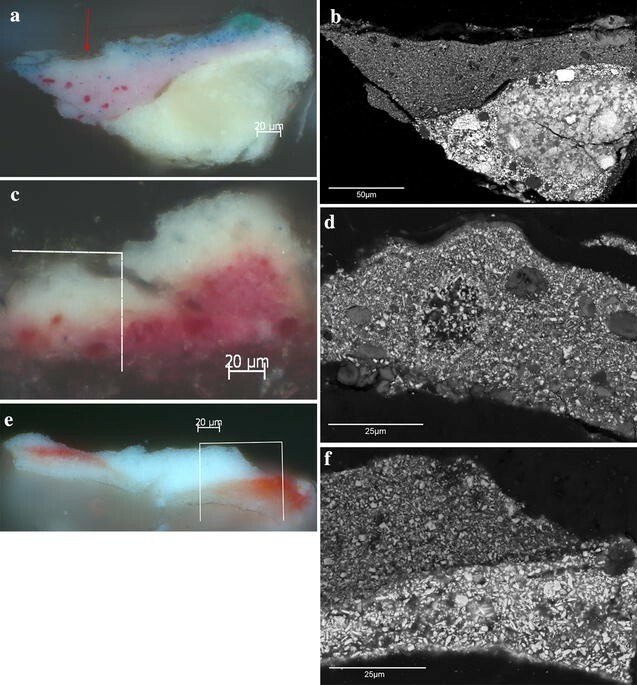 2d–f) showed the wet on wet application of eosin red and lead white paints, that the eosin red lake was precipitated on an Al-containing substrate, and that the small dark pink particles present in this sample contain eosin red on a CaCO3 substrate. It is well known that the inorganic substrates in lake pigments determine in part the stability of the colorants towards the exposure to light [11, 13]. To date, no inorganic substrates other than Al-based have been reported for eosin paints in works by Van Gogh , and no studies have been published on the permanence of eosin red as precipitated on CaCO3. SERS (Fig. 3b) and HPLC measurements (Additional file 1: Figure S3) on a microsample removed from the edge of the background confirmed that the only lake pigment used by Van Gogh in this passage is eosin red. SEM–EDS analyses showed that the white ‘layer’ on top of the stratigraphy is relatively more porous than the lower portion of the sample (Fig. 2f) and that Br- and Al-containing particles are present together with lead white. These results indicate that this is not a separate layer but part of the pink layer beneath and that it presently looks white due to fading of the eosin red lake. Van Gogh made multiple orders for eosin paint under the commercial name of laque geranium, or geranium lake, as soon as he arrived in Arles and continued to use it until the end of his life . The possible fading of a red mixed with the light green paint in the vase was also investigated by SEM–EDS and Raman analysis of a paint cross-section and it was found that it was intended to be light green, as it is painted mainly with zinc white with some emerald green and lead white, and no lake pigment particles are present. Color-calibrated microscopy was used to measure L*a*b* values in the layers composed of eosin red lake in the cross-sections removed from the flower and from the background of the painting (Fig. 2a, d, respectively). L*a*b* values were also obtained from reflectance spectra acquired in lake paint reconstructions of similar composition prepared by van den Berg et al. following a ninenteenth century recipe [11, 30]. These color coordinates and the ones obtained by reflectance spectroscopy in the flowers and in areas of the edge that had been protected by an aged brown paper were used for the virtual re-colorization of the painting . Reference was also made to the X-radiograph of the painting and to the Pb and Zn distribution maps for the color simulations. Color reproductions of Roses dating from 1928 to 1957 [1, 31] were useful for evaluating the relative values within the painting but only as subsidiary information to XRF mapping and other imaging techniques for assessing the distribution of the red lakes. The Br distribution map matches the location of the darkest reds in the flowers but the lightest pink passages did not register (Fig. 4a, c). The pink in the blooms were achieved mainly by applying eosin red and zinc white paints wet on wet and also by mixing these two paints. This complex layering and mixing interfered with and complicated the evaluation of the distribution of the eosin red lake by XRF mapping alone, but the chemical analysis of samples helped to clarify some of these issues and also to evaluate the distribution the brazilwood lake in the tabletop and in the stems. Results of RIS analysis are presented in Fig. 5 for a detail area in Roses, similar to the detail area shown in Fig. 4b–e. In this area, three red spectral ‘endmembers’ were found that well describe the dull red observed in the painting. The red paints mapped to portions of the ‘white’ roses and the roses’ buds (Fig. 5a). The red spectral endmembers in the 400 to 580 nm spectral range show an absorption from ~400 to 550 nm with decreasing absorption at longer wavelengths (Fig. 5b). At wavelengths longer than ~580 nm, the red layer becomes increasingly transparent and the underlying paint dominates the reflectance spectra. Two of the red paint endmembers are on a white paint layer and one (bottom spectrum in Fig. 5b) is on a green paint layer of the bud which results in the absorption at wavelengths beyond ~580 nm. In short, all three spectra suggest that a similar red pigment was used in these areas. These spectra have shapes indicative of a red lake pigment  rather than a semi-conductor, which would have a sharp transition (i.e. vermilion, cadmium reds or red lead) and they do not match iron oxide-based pigments such as Mars red . The combined map shown in Fig. 5a overlays with the deep red and light reds in the color image and, interestingly, with the Br distribution map in many areas. This also suggests the red pigment used is an eosin-based red lake. Also, the map of the red pigment/s aligns quite well with the strong red features seen in the book-plate image detail in Fig. 4b. The RIS maps give information in the visible at or near the paint surface as the optimal depth depends on the absorption and scattering properties of the outer paint layer whereas the XRF distribution maps can provide information at layers below the surface paints (noting that the matrix effect modulates this). This likely explains the few differences observed between the Br distribution map obtained by XRF mapping and the RIS maps for the reds. This is apparent in the comparison of the XRF distribution map for Pb and the RIS map due to lead white (Figs. 4e, 5c). For mapping the presence of lead white (basic lead carbonate) the narrow feature at 1446 nm (Fig. 5d), which originates from the hydroxyl first overtone, was used . The lead white used by Van Gogh is most likely a commercial product, expected to have a larger proportion of the basic lead carbonate over lead carbonate. In the RIS map, the 1446 nm feature is localized to one flower (top right) and a portion of the lower right flower (Fig. 5c). The white pigment for the other flowers is likely zinc white given the XRF distribution map for Zn (Fig. 4d) and the finding of strong absorption from 350 to ~370 nm in the site specific fiber optics reflectance spectra. SERS and HPLC analyses of a microsample removed from the edge of the pink tabletop that had been protected from light exposure by the frame rebate (Fig. 4a) showed that Van Gogh used brazilwood, and that no cochineal or any other organic colorant is present. Brazilwood was also identified by SERS and HPLC in a microsample removed for the dark red paint used for some of the stems, in which the lake—used without the admixture of white—does not appear to have faded to the extent observed in the flowers. The corresponding SERS spectra are shown in Fig. 6 together with the spectrum of a brazilwood reference, and the HPLC data is included in Additional file 1: Figure S4. Brazilwood and eosin lakes are the most fugitive red lake pigments among others used by Van Gogh such as cochineal lake . Therefore, carminic acid, the main component of cochineal and a more stable colorant, would have been detected by HPLC analysis if it was present in the sample. Burnstock et al. have reported that the most severe fading tends to occurs where the lakes are mixed with lead white or zinc white , as observed in the blooms. Geldof et al. in their study of Van Gogh’s palette in the last period of his life (1888–1890) found that, starting in the summer of 1889, Van Gogh used a paint containing a redwood colorant and cochineal precipitated on an Al/Sn-containing substrate, with a small amount of CaCO3, and state that he likely bought this as a ready-made paint mixture since they did not identify redwood separately . Redwood alone had been previously identified in Garden of the Asylum  by thin layer chromatography; both lakes were identified separately in paintings done while Van Gogh was in Paris . Two microsamples were removed from the tabletop and mounted as cross-sections for Raman and SEM–EDS measurements. The first sample was taken from an area where the pink paint is protected by the blue horizon line, on the right edge of the painting, and the second one from a spot where the red lake pigment has visibly faded (Fig. 4a). In the first sample, the pink layer is applied over the white ground preparation containing lead white and CaCO3 (Fig. 7a, b). 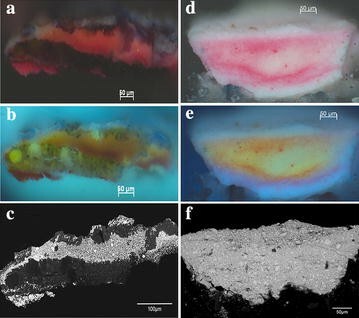 Raman analysis of the pink layer showed that the brazilwood lake is mixed with zinc white, while SEM–EDS revealed that the lake is precipitated onto a substrate composed of Sn and Al, and that there are a few CaCO3 particles in this layer. It should be noted that, in the pink layer, the red colorant has faded in the spot where the Prussian blue paint layer on top of the stratigraphy has a gap; this spot is indicated by an arrow in the photomicrograph presented in Fig. 7a. The second sample cross-section removed from the tabletop is missing the ground preparation layer (Fig. 7c, d). In the dark pink layer at the bottom of the stratigraphy, the brazilwood lake is precipitated onto a substrate containing Sn and Al and it is mixed with zinc white and few CaSO4 particles. In the white layer at the top of the sample, relatively bigger CaSO4 particles, CaCO3 particles, relatively smaller amounts of particles containing Sn and Al, also smaller in size, and larger amounts of zinc white were detected by SEM–EDS when compared to the dark pink layer beneath. The presence of particles containing Sn and Al in this white layer indicates that it must have been colored by a brazilwood lake similar to the one in the darker pink layer beneath and that this colorant has now faded. The relatively smaller amount of particles containing Sn and Al and the larger zinc white content in this white layer indicates that, originally, it must have been of a paler pink. In a sample removed from a rose in the right side of the painting (Fig. 4a), eosin red and zinc white-containing paints, applied wet on wet, were identified by Raman spectroscopy and PbSO4 was found to be present in the red paint by Raman and SEM–EDS (Fig. 7e, f). The composition of the red paint in this sample shown from Roses is similar to the one observed in the sample taken from a flower in Irises and shown in Fig. 2a–c. For the virtual color simulation of the tabletop, L*a*b* values were obtained by calibrated microscopy in the cross-section shown Fig. 7a, where the eosin red lake is protected by the Prussian blue layer, and by calibrated photography in the right edge of the painting, in an area that had been protected from exposure to light. For the color simulations of the flowers, the L*a*b* values used were those measured in the cross-section shown in Fig. 7e and those obtained in multiple spots in the roses by reflectance spectroscopy . Reference was also made to the X-radiograph of the painting and to the Pb and Zn distribution maps for the color simulations. 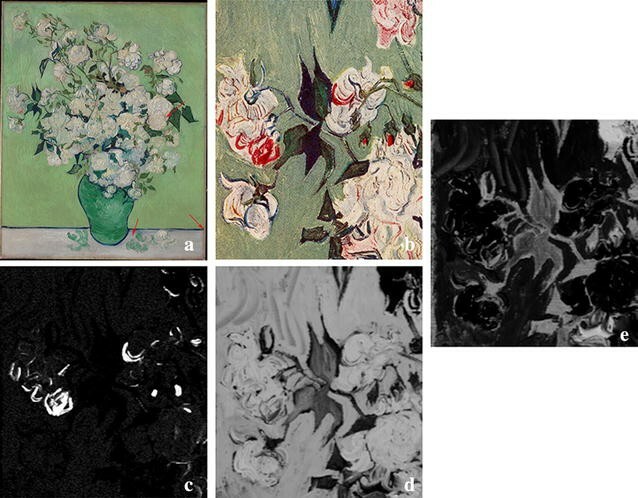 Imaging and microchemical analysis of Van Gogh’s still lifes, Irises and Roses, not only helped further understanding of Van Gogh’s working practice but also revealed to what extent different paint passages containing fugitive red lake pigments had changed. Fading of the red lakes has resulted in pink paints that now look white and in purple paints that now look blue. Since the works are part of an ensemble, the changes in each individual painting also affect the way we perceive them as a group. Studies like this provide new art historical perspectives and offer modern viewers a sense of how the works originally looked. SC, FC, AC and NS contributed to the acquisition of XRF, Raman, SERS, SEM–EDS and HPLC data, processing, and interpretation; CH contributed to the interpretation of data; JKD and KD carried out the RIS measurements and the interpretation of the data; GvdS and KJ processed XRF mapping data with PyMca and Datamuncher software; SS contributed with art historical perspective. All authors were involved in drafting the manuscript. All authors read and approved the final manuscript. Numerous colleagues contributed to the different aspects of the technical examination and to the color simulations: Barbara Berrie, Damon Conover, Ann Hoenigswald, and Giorgio Trumpy at the National Gallery of Art, Washington; Ella Hendriks, Teio Meedendorp, and Louis van Tilborgh at the Van Gogh Museum, Amsterdam; Michael Gallagher, Scott Geffert, Chris Heins, Evan Read, and Juan Trujillo at The Met; Aviva Burnstock at the Courtauld Institute of Art, and Klaas Jan van den Berg, at the Cultural Heritage Agency of The Netherlands. Francesca Casadio, at the Art Institute of Chicago, kindly shared with us a sample of a Kopp’s purpurin lake paint reconstruction prepared and provided by Klaas Jan van den Berg, at the Cultural Heritage Agency of The Netherlands. We are indebted to both colleagues for their generosity. This paint reconstruction was prepared as part of a project involving the two institutions mentioned along with the Shell Research and Technology Center, Amsterdam, the Courtauld Institute and the National Gallery, London. We are also thankful to Joris Dik, Delft University of Technology, and Koen Janssens, University of Antwerp, for the loan of an XRF scanner prototype to The Metropolitan Museum of Art. 40494_2017_131_MOESM1_ESM.docx Additional file 1. Additional figures. Stein SA, Hale C. Van Gogh, Irises and Roses. 2015. http://www.metmuseum.org/metmedia/video/collections/ep/van-gogh-irises-and-roses.